• The Challenges of Producing Fine Art on my 28’ Sailboat. 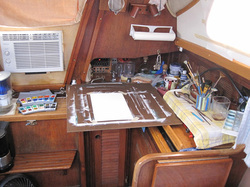 Most of the mixed media paintings you see on this site were painted while on my sailboat Summerwind. When I departed Boston a year ago to sail single-handed to Florida on my 28’ sloop, I packed a small water color set thinking that I would paint scenes along the way. That never happened. Bad weather and too many other ‘boating’ distractions kept my art supplies buried in an art bin. Little did I know at that time that I would be attempting to produce a series of watercolors for a gallery show that opened last year on the Treasure Coast, Florida. Since I was used to a large home-based studio, the challenges of producing art on a small sailboat were interesting to say the least! I bought some masonite for my “easel.” I found that if I moved my stove and re-arranged the galley, I could lay the board over the sink. The light there was good since it was directly under the companionway hatch. I was able to use this small spot only while standing. 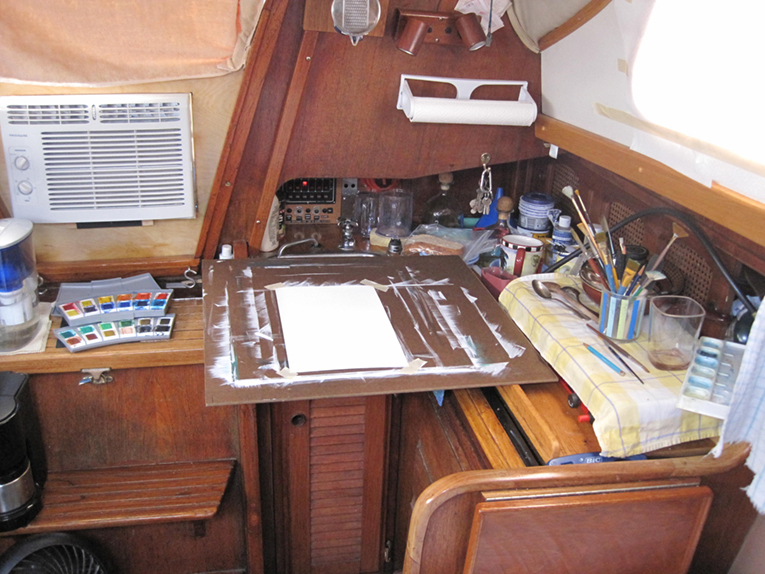 I could just fit my paints on the top companionway step and the palette with the water bowl on the board. This was all something of a balancing act since if I accidentally bumped the board the water would go flying! The next real problem was dealing with the motion of the boat. This was particularly aggravating when powerboats in the ICW channel would generate large wakes that would push through the Marina. I would have to stop painting as my boat lurched back and forth. This compromised the speed at which I needed to work and, on occasion, would ruin a piece: incredibly frustrating. Weekend wakes were so bad that I learned not to paint on those days. I now look at the many paintings I produced and think to myself…”Wow, I actually did those on my sailboat…! NOTE: I now have a land based STUDIO where I can once again paint with oils (not possible on a boat with limited space and the serious risk of vapor build-up). Since leaving my boat, all of my recent work has been the oil paintings shown on this website.